If you notice any airports missing, or any incomplete information, please include the information in this wikipost. I've also included a glossary of terms found in the list, below. ABQ - Alternating WTMD/Scanner. Left side goes to WTMD & Right side goes to MMW. Easy to self-select! ALB - Three MMW installed; Crew directed to WTMD, pax directed to MMW. North Checkpoint: Lane 6 Pre-Check; Lanes 5/4, 3/2 MMW & WTMD; Lane 1 WTMD-only (Employee line). Concourse E (After Customs): MMW in all lanes. Concourse F Main Checkpoint: MMW in all lanes. Concourse F (After Customs): MMW in all lanes. ATW - MMW installed at the sole checkpoint. AUS - All three C/Ps have MMW. When the C/P is busy, possibility of using WTMD, though it's not guaranteed. BIL - MMW installed at the checkpoint. WTMD normally roped-off. AC Checkpoint: MMW in all lanes. AA Checkpoint: MMW in all lanes. VX Checkpoint: MMW in all lanes. Gates C11-C36: MMW in all lanes. Gates C40-C42: MMW in all lanes. Gates E2A-E8B: MMW in all lanes. Terminal C (AA/Eagle) Full Body Scanner FREE! Terminal D (9K, B6, DL, UA, US) DL C/P now has MMW in all lanes. CLE - All checkpoints (A,B,C) have MMW. A only has one MMW and one WTMD, while B has two MMW. CLT - MMW Installed @ Concourse A, B, D - Concourse C C/P is SAFE! COS - As of 2014-10-01, MMW installed and setup as primary on right. WTMD for Pre on far left. WTMD for "special" people roped off in center. No way to avoid MMW or an opt out. CWA - MMW installed and setup as primary. WTMD roped off to the left. DAL - T1: MMW/WTMD combos. No SDOO unless MMW closed. T2: Two MMWs and WTMD next to each. Most pax sent through MMW. Terminal B/C Gates 23-34 (AA/US/VX) Two MMW installed and operating. Pre-Check installed. Terminal East Checkpoint (Near F9 counters) Four MMW in use. MMW is often primary. Far left/right lanes are WTMD only; one is now a PreCheck lane, other may be open when busy. Terminal West Checkpoint (Near UA counters) Four MMW in use. MMW is often primary. Far left/right lanes are WTMD only; one is now a PreCheck lane, other may be open when busy. DFW - MMW in use @ ALL D C/Ps - Installed @ A12, A21, A24, A36, B9 C8, C21, C31, E8, E33 (left/main lane) A12, B19, B33, C31, Safe - E15, E16, A23 WTMD ONLY! AA/CO/LH/UA/US/WM) North Term. has two checkpoints (North & South). Both have a WTMD and MMW scanner for each pair of bag x-ray lanes. DL (McNamara Terminal) All 4 checkpoints using MMW. Westin C/P Currently using MMW. ALL INCOMING INTL passengers have to go through this checkpoint. EYW - One backscatter installed at the only checkpoint. If in use, only option will be to opt-out. FAT - MMW installed. WTMD is still installed, but TSA may alternate between WTMD & MMW. YMMV! FLL - MMW installed at entire Concourse C C/P, DL Terminal 2 & 3 E/F gates has MMW installed and terminal 4 has 3 MMW installed. FNT - One MMW at the sole checkpoint. GNV - One lane at their checkpoint, and it now has a Full Body Scanner. Unsure of type. GRR - Full Body Scanner installed, and in use! HOU - All but four WTMD removed, and four MMW installed! HRL - One MMW and one WTMD. WTMD usually roped-off. JAX - 3 MMW devices for four lanes. Far left lane is safe, and it's pretty easy to get yourself into the far left lane if it's open. avoid the priority lane. JFK - No airside transfers between terminals - T. 1-8 have separate C/Ps, with no way to transfer. LAX-Airside Transfer Possible between entire south complex (T4-8) and TBIT. WN (T1) Family & Medical Lane is still SAFE. DL/AM/VS/WS/EI (T2) MMW on all lanes except Pre Check, which is now commonly open due to move. DL (T3) MMW except Pre Check. AA (T4)All lanes have MMW. When Pre Check is closed, regular lanes become "Expedited" lanes for Pre Check passengers. B6/NK/HA/SY/G4//F9/AA (T5) MMW everywhere; Pre-Check on the far right. AS/VX/MW/ZK/AC/ET/NK/SE/4B/MT, UA alternative, AA alternative (T6) Two WTMD/BKSX lane pairs in the center; one WTMD lane pair on each side. Pre Check on the far left. Not usually busy. UA (T7) New checkpoint open, with LHR/Canada style feeder X-Rays. Pre Check much less busy than before, with 2 lanes available at busy times. Tom Bradley International Terminal Currently using MMW. Can now access Pre Check by using South Complex checkpoints and walking. Particularly convenient if you use AA. Sometimes now doing Expedited at Bradley checkpoints for Pre Check carriers. Terminal A (Marine Air Terminal) (DL to DCA/BOS/ORD) MMW installed. Term. B, Concourse C American Eagle, United --- MMW Installed. Being used a primary. Term. B, Concourse D American --- BKSX used in farthest lane to the right. Use elite line to avoid. Terminal C (Delta/US Airways Terminal) (DL/US) 1 MMW installed at each of the Terminal C checkpoints. Alternate Checkpoint (far right): WTMD-only for the time being. LIH - Two MMW installed at the main checkpoint. One lane has no WTMD, while the other is MMW/WTMD combo. Gates 3-4 & 9-10 C/Ps are WTMD only. Gates 1-59 (AA/AC/AS/B6/EI/F9/UA/US/ MMW (replaced BKSX)[/COLOR in use at most lanes. Gates 60-129 (AF/BA/DL/FL/JJ/LH/VS/VX/WN MMW (replaced BKSX) in use at most lanes. MDW - One MMW installed in far right lane. Left and center lanes are WTMD only. MFE - WTMD still in use, but the Full Body Scanner has been installed and used. Unsure of type! MHT - MMW installed at all checkpoints. Concourse E (AA/AS/KX/WS) has 7 X-ray lanes. From right: Lane 1 SAFE; Lanes 2/3, 4/5, 6/7 have WTMD/MMW; not clear if crossover is possible. Elites can access Lane 1 on far right (also crew lane). MKE - Concourses C/D/E have MMW. Used as primary. Only option is to opt-out, or declare medical. MRY - MMW installed at only checkpoint. Used as primary. Only Pre-Check able to use WTMD, however laptops and liquids must still be removed from bags due to a shared x-ray. How to avoid The only MSP checkpoint free of MMWs is C/P 4. Terminal 2 (AA/AC/DL/US/B6) Multiple MMW installed. C/P 8 / Pre-Check lane is WTMD only. C/P 8 (non Pre-Check) Full Body Scanner only!! PVD - Main, and only, C/P has received BKSX!! Easily avoidable, by choosing a different line. Very easy to SDOO. RDU - 1 MMW installed at Terminal 1, WN C/P/ 3WTMD starting at the left, and Full Body Scanner on the right - 4 MMW installed @ Terminal 2 C/P. Concourse C (CO/DL One Millimeter Wave is in operation. SAN - MMW installed @ UA/DL CP in T2 @ Term @, Gate 1A/1/2 C/P for WN and AS side now- T1 Gate 1&2 has MMW installed. Pre Check at all checkpoints, except spotty at T2 AA/BA/JL checkpoint, but Pre Check available at UA/DL CP or Expedite available at T2 when Pre Check is unavailable. SAT - BKSX being used @ T1 & T2 C/Ps. As of 12/4, BKSX usually being used only for secondary or random, not primary. SEA - A (South) C/P (DL) has the Full Body Scanner, Central/Main C/P has the MMW, C gate C/P & D/N gates C/P has MMW. Terminal 1 One Millimeter Wave is in operation. Terminal 3 (AC/UA) MMW in operation. International Terminal G Two MMWs in use. Self opt-out is easy, if the far left lanes are open. SNA - MMW at all checkpoints. SDOO likely impossible. SJC - MMW at all lanes, except for the family line. - Terminal B has eight lanes @ the C/P, all MMW. WTMD available for Precheck in the far right lane. SWF - MMW installed at the the sole checkpoint. SDOO is nearly impossible. TOL - MMW recently installed. Only at one C/P. AMS - MMW throughout, with no WTMD. Opt out allowed and not questioned. Pat down is not as invasive as US or UK. BFS - MMW in place; location and details unknown. Opt-out permitted but may result in a search in a private room. BHX - MMW behind WTMD in lane 2/3; passengers who trigger the WTMD are scanned rather than being patted down. Opt-out permitted but may result in a search in a private room. BNE - MMW in use. Opt-out not possible. DME - One MMW in the business security area of the international terminal, unclear if opt out allowed. Setup is that WTMD leads directly into MMW - did not ask about opt out but did not seem likely. CGN - 2D: Full Body Scanner at primary lanes. Far left/right lanes & fast track still on WTMD. CPH - MMW at every lane, used only as secondary check if you beep the WTMD. EDI - MMW at the far left end of checkpoint, random selection. Opt-out permitted but may result in a search in a private room. 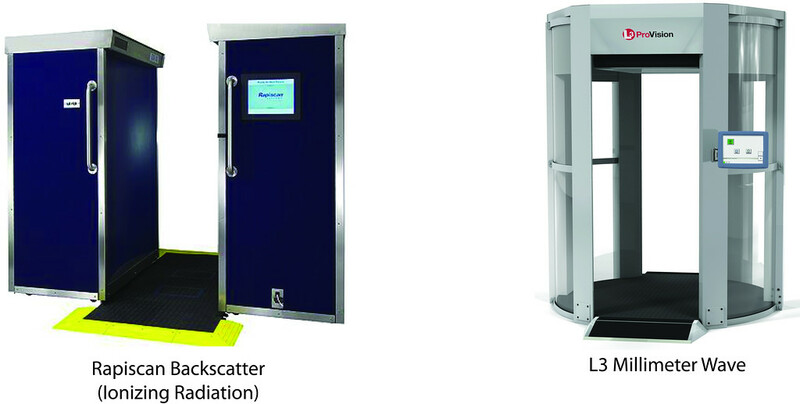 FRA - Currently investing in introducing 60 new scanners between May 2015 - early 2016. Some are already in place. Not every lane has Full Body Scanner. GLA - MMW at the left end of checkpoint, used as secondary check if you beep the WTMD. Opt-out permitted but may result in a search in a private room. LCY - MMW in left-most lane at the checkpoint with automatic entry gates. The checkpoint where someone scans your boarding pass manually is safe. Selection is random/secondary. Opt-out permitted but may result in a search in a private room. LGW - MMW in one lane per checkpoint, behind the WTMD, and if WTMD beeps the passenger is sent to the MMW as secondary rather than a pat-down. Opt-out permitted but may result in a search in a private room. Fast track is safe in both terminals. LHR - T1 MMW near checkpoint exit, random selection. Amex Fast Track is safe but BA fast track is not. All other terminals have MMW in one lane per checkpoint, behind the WTMD, and if WTMD beeps the passenger is sent to the MMW as secondary rather than a pat-down. Opt-out permitted but may result in a search in a private room. Fast track is not safe. The small transit checkpoints at T5B and T5C are WTMD only. T5 First Wing is not safe, with opt out to a private room and all bags checked. MAN - MMW all over the place, expect to be scanned if you beep the WTMD. Opt-out permitted but may result in a search in a private room. NBO - Nairobi, Kenya MMW some checkpoint at new terminal 1A. NUE - MMW at one security lane. Opt out allowed. STN - MMW in lanes 5/6. Use the right-hand of the three entrances to security which feeds lanes 11-15. Opt-out permitted but may result in a search in a private room. STR - MMW throughout T3. Opt out allowed. SXM - Only MMW installed, no backup WTMD. Opt out allowed. SYD - MMW in use. Opt-out not possible. YHZ - MMW in use in domestic/international departure area. All lines have WTMD. Unsure of transborder departure area. Opt out availability advertised. YOW - 1 Full Body Scanner in the Domestic/Intl C/P - Appears to be used for secondary screening - MMW. Opt out permitted and advertised. YUL - MMW in far left lane being used on all pax. OPT OUT Permitted and advertised. YQM - One MMW in operation. Looks to be for US bound passengers. Opt out permitted and advertised. YQB - One MMW in operation. Not used very often. Opt out permitted and advertised. YYC - US-bound pax use the MMW, randomly determined by a machine - OPT-OUT advertised. YYZ - T1, US Departures has the Full Body Scanner for SSSS/Random Selection/Resolution of WTMD alarms - T1 Domestic - 2 MMW for Secondary only. None in NEXUS line, not always in use - MMW - YYZ Concourse Level (between Arr/Dep) C/P has the MMW, usually sits idle. Opt out is advertised. YXU - MMW at checkpoint, secondary only, opt out advertised. YKF - MMW installed, secondary only, opt out allowed. LGA Terminal D (Delta) is still AIT-free, right? As of mid-December, yes, LGA Terminal D was WTMD-only. I had a brief conversation with a TSA screener there who didn't know when AIT was coming, and didn't want anything to do with it because of the hassles it creates. The backscatter machine at the LAX T4 priority checkpoint has been removed to accommodate for the trusted traveler program. Great to not have to play the SDOO game at LAX anymore. I flew out of BUR for Christmas and I saw what I'm fairly certain were two MMW machines there (though roped off) on my way into A terminal. Don't know when they'll start using them, but being such a small airport I'm not taking my chances. And despite the small size and what some have said on tsastatus.net, I'm fairly certain there are in fact two different security checkpoints there (one to each side of the main entrance). Could somebody confirm that DFW E15~16 has no AIT machines? Thank you! LGB is safe until the new terminal is complete in 2013. LGB is safe until sometime in 2013 when the new terminal is complete. LGB doesn't have room for any form of AIT scanner in its current terminal. Their footprint is too big. IAD - International to domestic transfers at Concourse C (midfield) - stay left and then left at junction to avoid MMW. SFO T3 (old AA) - MMW for everyone. In addition to the one already mentioned for BKK, there is another one located at the CIQ (domestic to int'l) transfer in the left lane. The right lane is still WTMD. As far as I'm aware STN doesn't have any body scanners. I am flying from GLA - MIA via LHR in the summer with BA which means that I will arrive at Terminal 5 and depart from Terminal 5, what are the chances of going through one of those machines? It is all booked on one ticket so I will stay airside I believe and won't have to pick up my luggage again until MIA. Zero. I don't believe you need to go through security again if you connect UK domestic to UK international, at least not from what I observed on my visit last week. Now if you reverse course, you would have to pass through security when transiting from T-5 international arrivals to T-5 domestic. But again, I saw a whole bank of old-style metal detectors and none of the bad ones. I heard They going to install the body scanners in Australian airports. This is not real specific at all. I don't think it's happening to put everyone into the scanner. They already have scanners in SYD, PER, MEL, CNS, BNE, ADL and Gold Coast, too. There is no reason to installed the bodyscanners at airports. The bill say "no scan, no fly" there is no such thing to put into the scanners. Those passengers who had it right go through the metal detector and not try to patted it down in the secondary screening area. No. They have scanners at MEL and SYD from the trial last year. They plan to install them at PER, CNS, BNE, ADL and OOL if the proposed legislation the government plans to introduce this week (Australian Parliament's first sitting week of the year) passes. The "Aviation Security Amendment (Screening) Bill 2012" has not been tabled yet. There seems to be little we can do about it, the idiotic Anthony Albanese is determined to have them. Just passed through security here in Burbank and they now have two MMW's up and running at the Terminal A (WN) checkpoint. Wasn't avoidable for me, but may be possible if both sides of the CP are open. Welcome to Flyertalk! You're right, only LHR, MAN, and LGW (north) have scanners. Per Boraxo, zero unless you inadvertently exit the secure area. Even if you do, it's very low.